For the style enthusiast on a mission. 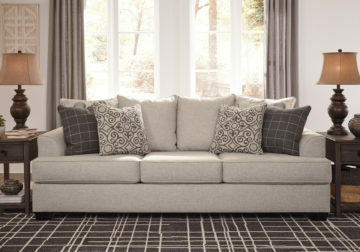 The Velletri sofa sleeper takes a unique approach to design. Two back cushions flaunt a vintage-inspired “Paris” script. Throw pillows continue the charm with gray-infused scroll and plaid patterns. Flare arms and neutral hue lend to transitional appeal. Covered in a luxurious linen-like chenille, its softness and luxurious comfort will keep you coming back. Pull-out queen mattress in quality memory foam comfortably accommodates overnight guests.